The B Woofer is full of funky features that will certainly keep children busy for hours! 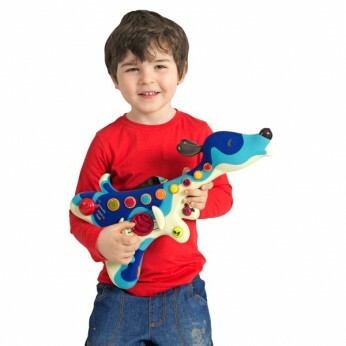 The product features three different play modes: electric, acoustic or hound dog. Choose your mood! Alternatively children could choose one of 20 sing-along favourites or one of 9 peppy puppy songs with lyrics and music book included. Learn to strum and play the Woofer with eight musical buttons that represent realistic C to C chords. Why not press the whammy dog bone to customise any song! The Woofer has an auto-off mechanism that will turn itself off after two minutes! General information: Batteries required: 3 x AA (included); For ages 2 years and over. EAN: 062243248335 WARNING(S): Only for domestic use. * 7492824 29.99. This toy costs approximately £24.99 (for the latest and best prices make sure you check our retailer list for the Woofer above). In our review of Woofer we classed it as being suitable for ages 3 years, 4 years, 5 years but recommend you check the manufacturer specific advice before purchasing.